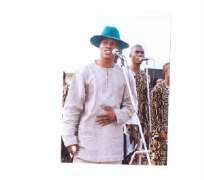 He is one of the hottest gospel musicians in Nigeria. Lanre Teriba aka Atorise's greatest ambition is to own his own radio station and preach the gospel worldwide. In this interview with OSEYIZA OOGBODO, he speaks about himself and his profession, but against all expectations, he disclosed that he is not 'born again', at least, for now. Can you tell us the latest about Atorise? The latest about me is that I just came back from US. I just finished my six months tour of America. So how was this American tour? Was it already in your plans that you would perform with Yinka Ayefele in America or it just came up over there? It wasn't in my plans when I was leaving Nigeria. But over there, when people saw how good I was on stage and how I was always attracting a crowd, someone just brought up the idea that Ayefele and I should have a concert together, because we've never played together on one stage before. There is this popular belief that Nigerian musicians don't make money from their tours abroad. What is your experience? I make more money in Nigeria than America, but I didn't really go there to make money. At the same time, I went there to make money, you understand, but the fact remains that I'm more contented here in Nigeria than abroad, so I went to America for exposure and another thing, to spread my music, to spread the news, you know I have a calling, before I started singing, and my calling is to preach the gospel throughout the whole world and my American tour was an opportunity for me to do that. Apart from America and Nigeria, which other countries have you preached the gospel? 've preached it in London, and anytime from now I'm going to Europe, as I want to preach it all in the Schengen countries, probably next year. How about Asia, China and all the rest? Yes, they are part of the world. If I have my way to go there, I will, definitely I will. Considering your calling of preaching the gospel, do you intend to start a church that you will be its pastor? No, I've never dreamt of being a pastor. I don't even want to be a pastor. This is my profession and where I have my calling. Do you win souls for Christ? Of course yes. I love to win souls whenever I have a programme. I have a vision and mission, my own way of winning souls. Why are gospel musicians not being nominated for international music awards such as Channel O, MOBO, etc? That is one of the areas I'm really having problems with people, because I don't see why people rate secular things more than the spiritual. God is the highest in everything, but people don't really put God first in everything they are doing, you know, and it's not really fair that all these awards organisers don't really consider gospel music, whether Islamic or Christian, so what I just want is for people to carry us all along, music is music, but at the same time, everything we're doing in life, we have to respect God, and Christian music is God's music, so people should look into that. Certainly you are a born again Christian. I'm not a born again, I'm not, it's not a day's job. Someone can just stand up and say I'm born again. I look at those people and just laugh, you understand? I am a repentant soul, and I have my own personal pact with God. How many albums have you produced since your hit debut, Atorise"! I've released about ten albums till date. If you compare all of them, which would you consider a best seller"! All of them did fine. But one thing I just believe is that my best is yet to come. I'm just trying my best and working hard but it's only God that can take me to where I really want to be. How did you come about the concept for your New Chapter video that people are always talking about? Well, we sat down together, I mean the director and artist, and we brought out the concept to shoot the video, you know, I'm a kind of creative guy, I believe in creativity. So, we sat down to do something that's never been done in our gospel music industry, that's the reason I told you just now that I have a mission and a vision, lots of fresh ideas that I will transform into new things that people I've never seen. I play anything percussions, but right now, thelast time I went to England, I spent a month there and I registered for a school of music to study more about strings. So how far have you gone in your learning? Well, I'm just trying my best, still learning. When you say strings, you mean the guitar, right? The keyboard, lead guitar, bass guitar, and the horns as well. But can you learn all of them at once? I can. You know it's best to be a complete musician, because this is the only thing I do for a living. How long have you been practicing music? I've never practiced music before. You know I told you I have a calling to sing, and I've never dreamt of being a musician before in my life, but I found myself in it. Okay. How long have you had the calling now? I've had it for the past ten years. The first time I answered the calling was when I released the first album. You know, when I finished school, I tried my best to secure a job but I couldn't get any. I spent like five years at home jobless, so I did the first album like child's play and God made my way through. So what's your next step now? Right now, I'm really working toward opening a radio station, Praise FM. But the problem I'm having right now is that the federal government doesn't want to issue me the license because they don't want me to operate 100 per cent gospel radio station. They want me to include secular programmes and I don't really want to do that. So how are you going to solve the problem? Well, I'm still praying to God over it. I don't really know what to do exactly, I already have the equipments, but I know my God will take control of the situation.